More than that, we are seeing this fare hike in the midst of train breakdowns becoming a “regular affair”, with commuters experiencing service quality and reliability lapses. 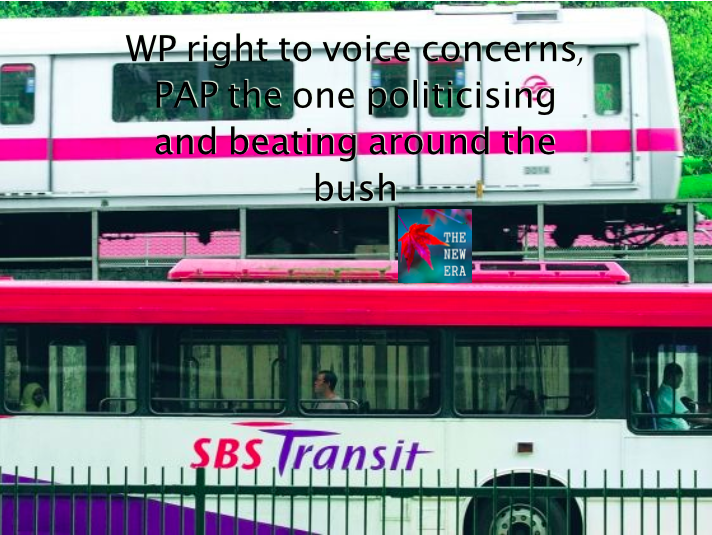 The WP also expressed disappointment over the fact that the hike come “three months before the concession schemes for low-wage workers and people with disabilities are to be implemented.” They therefore call for the fare hike to be delayed until the new concession schemes are implemented. Delivered by Tan Lip Fong of the Executive Council of the Workers’ Party, it was not long after which that Josephine Teo, a PAP MP and Senior Minister of State, made comments on facebook that equally quickly got onto to the news of the PAP-biased mainstream media. In the facebook status, which in no way looked like a “government statement”, she tried to push blame on “fine prints” and said there would be “transport vouchers of between $30 and $80 are going to both groups from April to tide them over.” Gerald Giam, WP NCMP and head of WP’s media team, had responded by saying those “handouts” were of low take-up rate because of the trouble needed to go about obtaining them. Such is, as many believe, typical of the many “grants”, “subsidies”, “claims” they “provide” around Singapore. But Josephine Teo did not stop there and then. She did not miss the opportunity to say WP “never misses an opportunity to pander”, and that it had “claimed credit for the concessions”. It is surprising that when parties point out mistakes, and speak up for the people, whether or not they are doing it for party political reasons, that seems to be the only kind of response we can get from our less-than-intellectual PAP personnel. Instead of arguing back on reason, it wants to put people in bad light for the sheer act of voicing out. It would not be surprising that people find their “calls for opinions” in the “National Conversation” and other PAP-approved avenues a “farce” and a “hypocrisy”. She even pointed out that WP’s statement was “largely predictable”. But so what? Does that not only mean one thing – that the WP is a credible, stable and trustworthy party true to form and wisely and dutifully cautious with its words? Oh, when parties makes comments that come up less than usual, the same PAP would say they are “surprised at the combative tone” (think Teo Chee Hean during the BE)? She pointed out that “someone else had done the real work of sorting out the math and getting the balance right”. Oh yes, if that were not the duty and responsibility of a government – that does not like sharing resources and data with others – then whose is it? “More buses, more drivers, more trips on the road, more depots and interchanges, more maintenance, more equipment. In WP’s world, these things can all be achieved without more effort and resources. Not in the real world,” said Mrs Teo. How many times have we pointed out that the money the government uses comes from (and belongs to) the people whichever way it is collected and utilised? Government collects tax revenues and in turn has the budget capabilities for spending across the various sectors the year round. We have asked, from time to time, why so much of that sum is allocated for defence, and so little for healthcare and other welfare services. “Do not breed a culture of dependency” is the usual response and official stance. This is despite the fact that this government also likes to conceal their fascist nature by having wayangs (shows) of “social welfare” of their own unique definition, once in a while. In the real world, Ms Teo, democracies do not allow one single party to rule and dominate in such a way, and one person to hold the helm for so long without question. In the “real world”, people go through debates – yes, fierce Parliament debates – and other means to determine decisions and policies. Maybe Josephine thinks the social democracies in Europe do not belong to the “real world”. We leave that to our readers here and beyond to scrutinise, dissect and analyse that simple sentence. Because if we did not remember wrongly, just days ago, Lui Teck Yew, the transport minister, actually “thanked” the PTC for making the decision to allow fare hikes because they are always “unpopular”. By Teo’s statement, she seems to imply that just because of the concessions that conveniently come together with the fare hikes, people should feel “satisfied”. Maybe that is the “balance” the PAP is talking about. The “calibration” that Lee Hsien Loong has been talking about. As far as we can tell, it seems that the Workers’ Party is just doing its diligent job of voicing legitimate (and long-standing) concerns of the public on transport costs and service qualities. On the other hand, the PAP is nit-picking at WP for seemingly baseless faults and “accusing for the sake of accusing”. It never misses on the opportunity to firstly divert attention away from and avoid tackling main issue alone, and secondly, attacking the Opposition whenever it finds the chance, whether or not the chance is good! And the MSM, what is it doing? Look at TODAY’s headline: “Govt issues sharp response to WP reaction on fares“. What in the world was that? A little comment by Josephine Teo on facebook now becomes a “sharp response” from the “Govt”? Wow, what a way to bootlick at this great opportune moment? With that, we wish Singaporeans “more good years ahead”. Run Run Shaw and his brother Runme Shaw were pioneers of film culture in Singapore when they funded one of the island’s earliest features, the 1934 Malay-language production Laila Majnun directed by B S Rajhans. Besides spearheading Cantonese films set here and in the Malay Peninsula, what distinguished the brothers’ enterprise in Singapore were their contributions in heralding the golden age of Malay cinema in the 1950s and early ’60s, by cultivating outstanding artists such as P Ramlee through the Malay Film Productions (MFP). From its studio at 8 Jalan Ampas, the MFP produced about 150 Malay-language films within two decades, about a third of them involving P Ramlee. Although the present premises have not been demolished, they remain closed. To honour the brothers’ legacy, the premises tucked away near Balestier Road should not only be preserved,but re-energised as a film museum and resource centre to support aspiring film-makers from ethnic minorities. Although Indians and Malays such as B S Rajhans and P Ramlee were synonymous with Singapore cinema in 1965, today’s generation would think only of Chinese-Singaporean film-makers such as Jack Neo and Anthony Chen. There must be more support for minority film-makers to have the voices of their communities heard and to give them greater representation in the industry. Editor’s note: We support the encouragement of local production, whether Chinese or non-Chinese, especially those that really come from the heart of hearts of our citizens and commoners. Basically that means giving real voice to the people to speak up and express themselves, through means not restricted to films itself. That also means we do not restrict ourselves to just some artificial-looking, propagandistic films that we shall not name here. Run Run Shaw, the colourful Hong Kong media mogul whose name was synonymous with low-budget Chinese action and horror films — and especially with the wildly successful kung fu genre, which he is largely credited with inventing — died on Tuesday at his home in Hong Kong. He was 106. His company, Television Broadcasts Limited (TVB), that produces most of our Hong Kong dramas, announced his death in a statement. Born in China, Mr. Shaw and his older brother, Run Me, were movie pioneers in Asia, producing and sometimes directing films and owning lucrative cinema chains. His companies are believed to have released more than 800 films worldwide. After his brother’s death in 1985, Mr. Shaw expanded his interest in television and became a publishing and real estate magnate as well. For his philanthropy, much of it going to educational and medical causes, he was knighted by Queen Elizabeth II and showered with public expressions of gratitude by the Communist authorities in Beijing.